At the end of July, my wife and I went looking for a cheap, last minute all inclusive holiday. Finding Europe still overpriced, we opted for two weeks in Cuba. We flew out from Manchester to the beautiful island of Caya Coco. This gorgeous forested resort has only 4 or 5 hotels, and has the most gorgeous beaches and very uncommercial. Our first week was spent in an idyllic and restful state. As we were on holiday, we avoided Facebook and other social media sites. However, I did go online quickly to check on something at the weekend, and saw a message from one of my sisters in law telling me that there was a possibility of a hurricane coming our way. Then on Monday when I phoned my daughter, her husband also pointed out there was a hurricane coming our way. I then switched on the television and looked at CNN and heard about Irma heading up towards us. We then realised that things could get difficult. As time went on the situation became more and more serious. On Tuesday it was announced that the area was on an official hurricane watch. That changed on Thursday when were told that we had to meet in the main hotel lobby at 1330 with all our suitcases packed and that the whole island was going to be evacuated up north, a 7 1/2 hour drive to Valadero. Canadian tourists had been flown back home, but for some reason Thomas Cook decided not to fly us home; in fact they still flew the latest batch of tourists into Caya Coco on theWednesday. After hours of delay we set off on this road trip. Crossing, for the last time, the 17km causeway, with pink flamingos resting in the water, that joined the island onto the mainland, stopping only once, at a petrol station, where the shop basically only sold coffee, beer and cracker biscuits. Arriving just after midnight at the Iberis Starfish hotel, we all alighted he bus and were given our rooms. Tired and weary, and a bit hungry, we made our way to our room. On entering, we discovered it was ant infested, on the floor, in fact everywhere. The hallway leading to the room looked as if they hadn’t been cleaned since Castro officially opened it in 1977. Holes in the ceiling, dog ends on the threadbare carpet and mould were only some of the defects found. We headed back down to reception to complain only to find the around 3/4 of the 20 bus loads of people were in the same situation. In protest, we all decided to spend the night in the public areas of the hotel, snatching only small stretches of sleep. About 6.30am, we decided to go up to our rooms to quickly shower and change, a nap was put on hold when my wife saw ants on one of the beds. Mid morning, after a bit of breakfast, we were allocated another room. This one totally opposite in quality, being utterly five star. It wasn’t empty yet as the guest within hadn’t checked out. We returned after 2.30 pm to find that she decided not to check out, and the hotel staff had neglected to inform us. They then gave us another room, actually a bungalow outside the main building, in the gardens near one of the pools. So around 4.30pm, twenty four hours after we left the island, we eventually went to bed. A good bit past midnight we awoke, having missed dinner, to the sound of the wind blowing a hooley outside. Looking out the windows, the trees had already begun to lose some of their fruits. Just after 7 am, I saw that the buffet breakfast area was open. After eating we had a meeting to attend in the main building, walking up to it through puddles of water and broken branches lying strewn the gardens and footpaths. At the meeting we were informed that those guest who were in the bungalows were being moved to the main building, and that all the guests were being confined to their bedrooms to ride out the hurricane. Each section of the hotel had a staff member on hand to assist. On entering our room. We saw that the sliding patio door type windows, had broken seals and that there was was gaps between the glass and the frame. We immediately took the mattress off one of the beds and placed it in front of one of the doors, and then took the bottom of the bed and placed it in front of the other door. Getting towels from the maid, we placed them in front of the window on the floor, and the same in the bathroom. It was a case from there on in of wringing the towels out and mopping the floor, until we gave it up as a bad job, and joined some of the other people in the corridor along with Maria, the customer service assistant, who proceeded to give us free salsa lessons. Around this time, another member of the hotel staff came up and told us all to get our necessary belongings, not our cases, and get into the hallway. 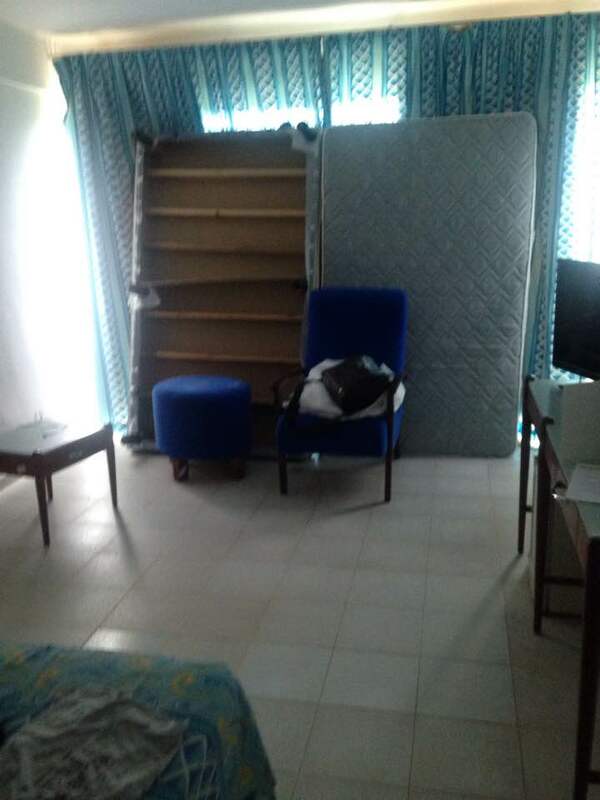 So, chairs, pillows, food, towels etc were removed from the rooms to the safety of the aforementioned corridor. 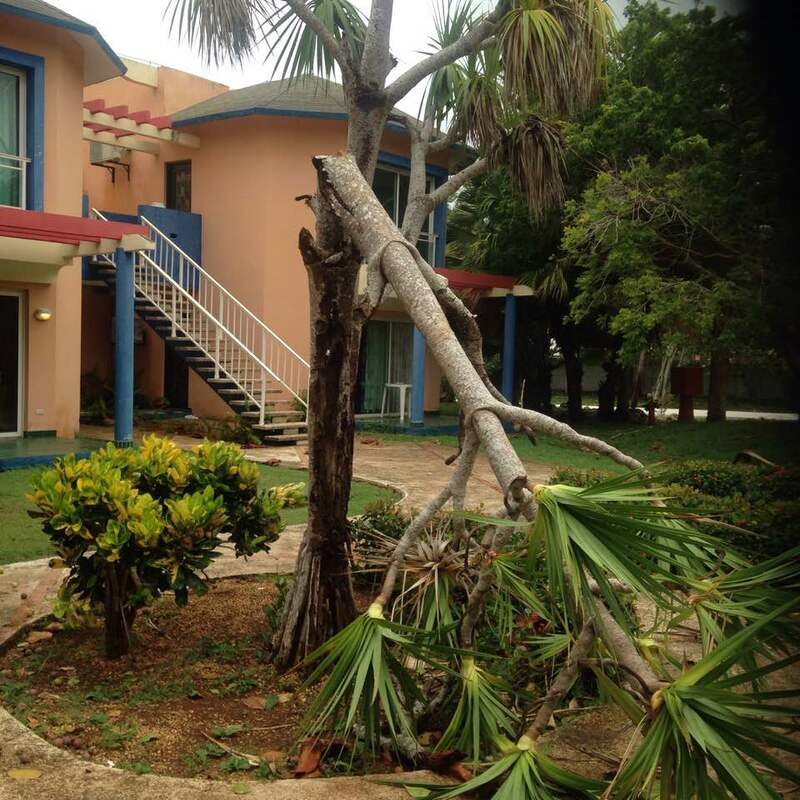 The category 5 hurricane was well taking hold in this part of the country, after demolishing our previous holiday destination. After being out of our rooms for a couple of hours, we heard a crash from within our room, and when I tried to get in, even with two of us pushing, we couldn’t open the door. The window had obviously been blown in, and the wind was swirling round it. Later a male staff member arrived, and we managed to get into the room, where our suitcases were rescued from the safety of the cupboard they resided in. It transpired that the window with the mattress in front of it had blown in, and broke, but the only thing that stopped it shattering, was the fact it had fallen on the mattress that wa placed in front of it. The one with bed was still holding up. Water was all over the floor, and the television was rescued in case it blew away. We immediately took the mattress off one of the beds and placed it in front of one of the doors. And so the long and hot vigil continued. Around 11pm, we were allowed back into our rooms; or to be more precise, those on the left side as the other side, our side, was deemed too dangerous. A Canadian couple gave us their room as they were going to share with their teenage daughters. We just had time to clean our teeth and we were called out again, as a window in a room on the ‘safe’ side had blown in. Fortunately it was just a store room, but people’s safety was paramount. Just before 1am, the door to our damaged room was opened a tad and a small wedge was put in place so fresh air was able to circulate along the passageway. Much to everyone’s relief. Every action has an opposite reaction they say, because just as it became easier to breath, the power went out. Eventually sleep came to all, some on chairs, some on suitcase tables, my wife and I on a blanket on the ground. Daylight came and the rain had ceased but the wind, although lessened, was still blowing hard. Looking around the outside, the devastation was unmissable. 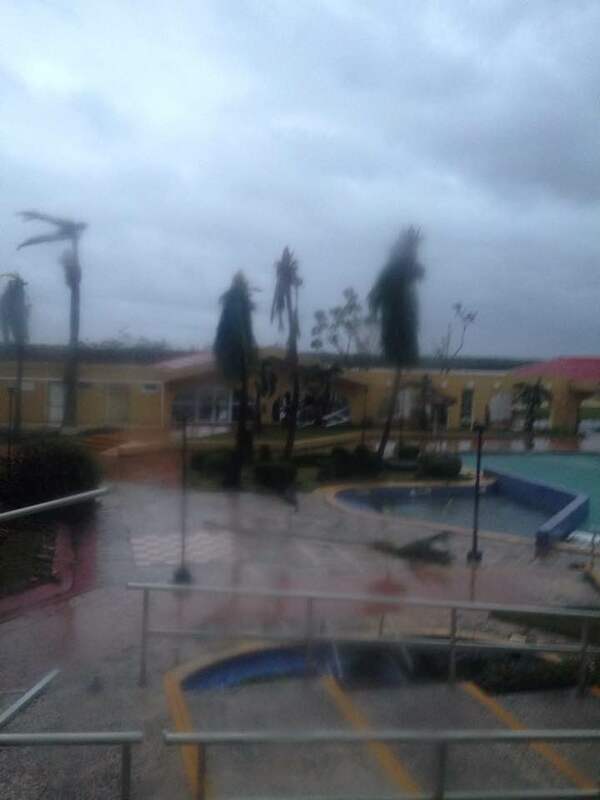 Trees down, roof tiles shattered, many windows smashed and water in places water wasn’t meant to be. Areas inside, which had openings to the outside were as badly damaged. Ceiling liners all over the walkways, electric lights also. Vegetation had found its way into the interior as well. Within hours though,such was the efficiency of the staff, that all of the interior debris, in public places had been cleared and people were able to move about freely. Some exterior areas had been made accessible too. Food was still being delivered to the guests. Normality resumed later that evening. Despite being informed that we would be under lockdown from 10pm, the bar, which had only been serving coffee or tea and soft drinks, started serving beers at the back of nine, and remained doing so until 11. Food was no longer being delivered, but was being distributed in the bar area. Sunday saw things return to some semblance of normality, well as of normal as possible. The buffet restaurant reopened for lunch, it had its own generator. The fridges/freezers however were still down as they were on the grid of the local town. A lot of the main footpaths were being cleared by hand, with the only extra being a lorry was deployed to pull the trees away from the walkways. News was given that the airport had re-opened and all the Canadian tourists were going home on Tuesday along with 3 three flights of the Thomas Cook ones. Our flight, which was due to depart on Wednesday, appeared to be on schedule. So as I finish writing this, I have just returned from the bar where a trio of elderly Cuban men played some Cuban music, and, yes I did get up and dance, the first up. After all it was my birthday on the day of Hurricane Irma. Is Mother Nature Beating Trump Back? A Freedom of Information request response indicates the Marram-haired moghul is no match for Mother Nature. The FOI disclosure also shows that while the club and the Shire have a chummy, joking relationship, they are failing to keep the Master Plan updated. Suzanne Kelly reports. 2016 correspondence between Aberdeenshire and Trump International Golf Links Scotland indicates all might not be well at the so-called ‘World’s Greatest Golfcourse’. The Masterplan is not looking particularly masterful. Scotland’s shifting sand dune system appears to lack the level of deference Aberdeenshire has shown to Trump so far. “… all correspondence – whether electronic or paper based between Aberdeenshire Council and Trump International Golf Links Scotland, Menie Estate, Balmedie AB23 8YE, and / or any parent company thereof concerning: environmental health issues, use of chemicals, waste management including incineration of waste, drainage, ‘bunds’ such as those near Leyton Farm Cottage on Leyton Farm Road, animal populations, use of private security firms, data protection compliance for the year 2016 to date. The heavily redacted response (some pages are fully redacted) shows that sand and wind are causing havoc. * A 22 February memo refers to a site visit which took place on 19 February. This email memo indicates work was done on the burn and the dunes; an email presumably from the Shire council asks for photographs of the burn prior to works being carried out. “… you will clearly see that the burn is full of sand which has caused the water levels to rise and flood and cause damage to our bridge, etc. You guys personally witnessed the sand/blow movement that was blowing sand into areas of the burn. And that was not even a dry windy day. “The pictures of the dunes again you will clearly see we did not clear any existing marrum grass of [sic] the dune itself. 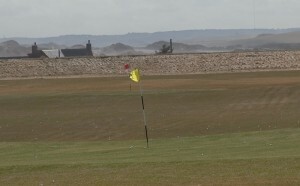 All these areas were pure sand caused by the storms which resulted in the sand blowing all over the 4th hole and filling up the burn on the far side. Perhaps attempting to stabilize a sand dune system on the North East coast of Scotland in Winter was not such a good idea. 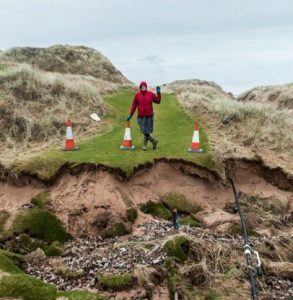 Suzanne Kelly witnesses course erosion on a previous visit to Trump International. The Shire subsequently acknowledges that the before and after pictures ‘shows the damage’. There is banter between the parties as to how cold it was on the visit, and how being a marram planter is not one of the visitor’s career choice. The conversational tone is perhaps not the same as the Shire’s planners use when dealing with normal members of the public who have had planning breach issues. When the planning and environmental issues were dealt with by the Scottish Reporters’ Report, when the golf complex was approved, the idea was to have environmental monitoring that would be robust and thorough. This is not happening. “Having reviewed the approved Management Plan this does not cover such events [presumably the winter storms; if so this would seem to be a major oversight] in sufficient detail (Major blow out of the dune ridge). These dune systems are very dynamic in nature [you don’t say] and one of the features it is [sic] particularly noted for is the mobility of the dunes. Therefore it is likely that the same event could reoccur in the future. Is the Shire suggesting that the protection of the club needs to be managed? Who will weigh whether such future ‘management’ will have a negative impact on biodiversity and tne nature of the unique dune system? Certainly not Professor Bill Ritchie. Ritchie was quoted in the Reporters’ Report as supporting the Trump scheme. He was to have kept the environmental watch group ‘MEMAG’ working – but as its minutes show, MEMAG descended into shambles, with Trump personnel skipping meetings. Ritchie never commented on this situation. “I note that the Management Plan states it is to be reviewed annually which has not been the case as far as I am aware. Therefore I would request that this is reviewed in light of the recent storms and steps identified of how to deal with future storms with particular emphasis on the watercourse and coastal dune ridge. 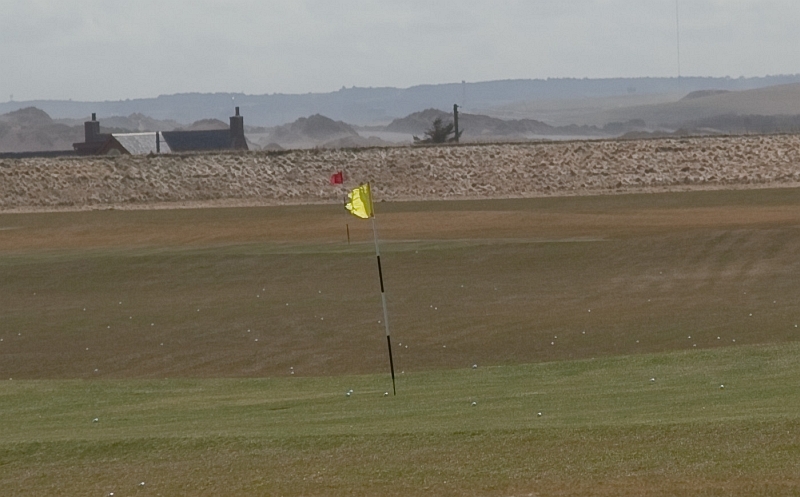 Is so-called ‘long term damage’ the same as the dunes following the previously-natural moving and shifting pattern? Did the environmental experts do their job correctly in approving the area for a golf course? The case could be made that the environmental experts might have underestimated the power of storms and the dynamic nature of the dunes. Having stood on part of a collapsed course some years back, and reading this now – it looks like a case could be made that the experts got it badly wrong. It could be inferred that the Habitat Management Plan is possibly not updated either, seeing as the Management Plan is not being updated. Sadly, the emphasis is clearly on avoiding complaints regarding otter habitat rather than on protecting the otters, their habitat, and other wildlife. Perhaps this failure to properly estimate the dynamic dunes, the wildlife and the storms means that an overly-rosy picture was painted by the golf resort’s protagonists? From here, it looks like development of a wild place at all costs prevailed on the day the course was permitted. However, it now seems Mother Nature has failed to read the memo on Trump’s vision for the ‘world’s greatest course’ and is taking a bit of direct action herself. 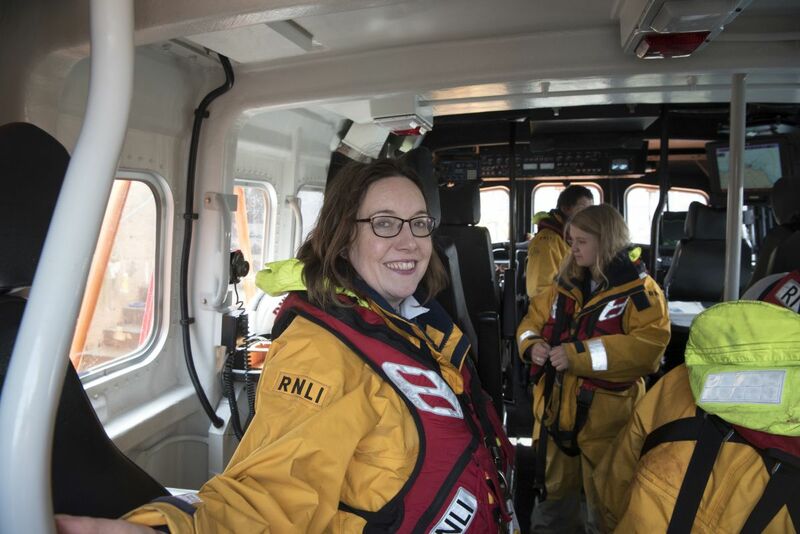 BANFF & Buchan MP Eilidh Whiteford has joined members of Fraserburgh Lifeboat crew to mark the launch of the Royal National Lifeboat Association’s summer campaign to raise awareness of staying safe by the sea. 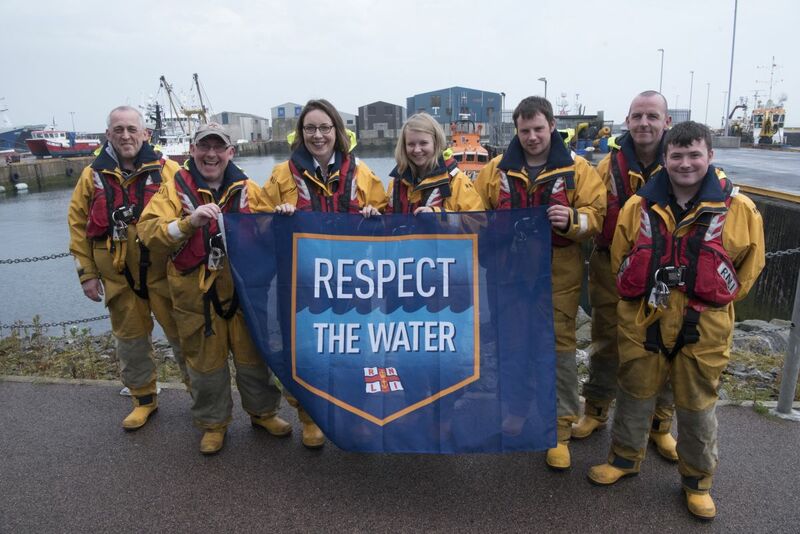 ‘Respect the Water’ aims to spread awareness on safety at sea, particularly during the summer months, and decrease the number of deaths at sea by half by 2024. Around one-hundred and ninety people die at Irish and UK coasts each year, and the majority of these people do not intend on entering the water. 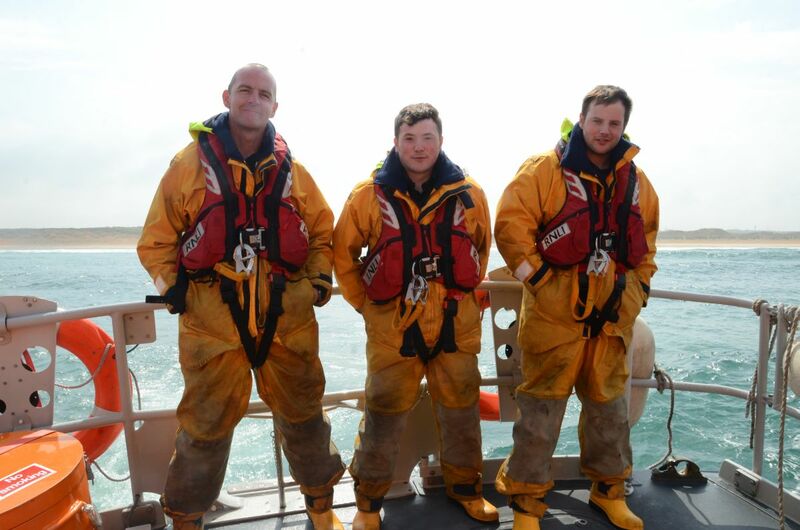 Dr Whiteford visited the Lifeboat station in Fraserburgh on Friday to meet Coxswain Vic Sutherland and other Lifeboat volunteers, and joined the crew on a training exercise off Kinnaird Head. She also met with representatives of the RNLI at the group’s reception at Westminster to launch the campaign yesterday. “Everyone in Banff and Buchan needs to know about safety on the water and around our coastline. With so many local livelihoods dependent on off-shore industries, most folk already have a healthy respect for the sea, but every year preventable incidents put lives at risk. “Speaking to local lifeboat crew members, there are particular risks at this time of year with dinghies and other inflatables. Strong rip tides on some of our most popular beaches, and our windy weather, can cause real dangers to swimmers and those involved in other water sports. Another well-documented risk is people falling in harbours late at night having left pubs or clubs. “For nearly two centuries, lifeboats have set out along the Buchan coast, and last year alone, Scottish lifeboats rescued over a thousand people. Since the RNLI’s establishment in 1824, it has saved more than 140,000 lives. Even allowing for the timeframe, that’s an absolutely astonishing level of heroism, and the men and women who volunteer to crew our lifeboats deserve enormous gratitude and support. Respect the Water have identified that the main risks originate from three separate factors. These entail: shock, rip currents and waves, and suddenly falling into water. The shock that cold water brings to the system takes air from the lungs and causes people to feel helpless leading to a panicked state. The unpredictability of the water is a highly influential factor in the cause of drowning, as currents can pull even the strongest of swimmers far into the sea. Lastly, people can drown by tripping, slipping or falling into the water unexpectedly. Studies have shown that out of the total number of deaths, two-thirds are male. The campaign is targeting men aged between sixteen and thirty-nine years old in particular, who are the most likely demographic to die at sea. 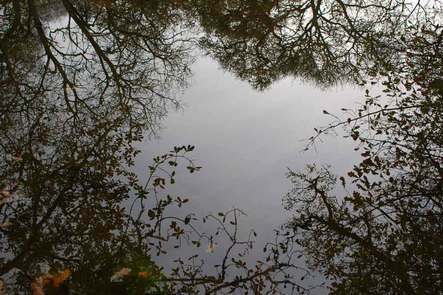 The RTW campaign found that last year, on average, fifteen per cent of people in the UK recognised Respect the Water and a higher percentage of twenty-one per cent of males had acknowledged the campaign. This shows that RTW had successfully raised awareness throughout the UK after being a national campaign for under a year. This year, Respect the Water will advertise its campaign in several different ways, including poster advertising. From August 2016, RTW posters will be put up on billboards all around the coast, in male lavatories and pubs situated near water. By the end of this month, the RTW campaign will introduce an interactive video to social media sites which will put people in a water related scenario and have them choose what to do next. Soft wind amongst the grass gathered courtiers. Each day to me as I sit on my own. Can shelter me more than could cairn or tree. With thanks to Jennifer Kelly, Tricker PR. A cosier winter is in sight for homeless people across Scotland this winter, thanks to the Scottish Women’s Institutes (SWI) picking up their knitting needles and casting on in support of a national campaign to help make a difference to the lives of Big Issue vendors. As Scotland’s largest women’s organisation, and with many members talented sewers and knitters, the SWI is throwing its weight behind The Big Issue Foundation’s Big Knitathon to ensure that this year’s effort is the biggest and best to date. Throughout November, the women will gather to knit garments, raise funds and hold events, all of which will benefit homeless people in Scotland. And, in a powerful message to get others involved, they are providing two Big Knitters – expert knitters who will help promote the Big Knitathon by attending events, posting tips online and answering knitting queries. Although the SWI is no stranger to supporting important issues and worthy causes, it’s the first time that the 17,000 member organisation has been involved in the Big Knitathon – and members are determined that their backing will make a big difference to the lives of people who have become homeless. The SWI will be working alongside Hobbycraft, another key supporter of the campaign, with all 83 stores taking part nationwide. As the leading ladies and resident ‘Big Knitters’ for the campaign, mother and daughter Anne (73) and Jane Muirhead (47) are determined to encourage all members – from novice to seasoned professional – to keep their knitting needles by their side for the month of November. “For as long as I can remember we, as an organisation, have gone above and beyond to support local and national causes. We’re passionate about making a difference and helping others in need. “I’ve been a member for 40 years and I still love the fact that when we work together, we achieve extraordinary results. I, and many of my fellow members, were taught how to knit in primary one and so have had the best part of 70 years to perfect the skill – and practice we do! The Big Knitathon is an annual campaign to encourage knitters across the country to create clothing for the vendors, sell the finished articles to raise funds, or hold events with all proceeds going to The Big Issue Foundation. Over the last three years over 2000 knitters have got their needles out for the Big Knitathon and raised over £22,500 for the campaign. For The Big Knitathon, SWI members are being encouraged to teach novice knitters, share skills, donate knitted goods organise fundraising events and document their knitting journey online through social media. They are also encouraged to attend the nationwide Hobbycraft event on Saturday 14th November. 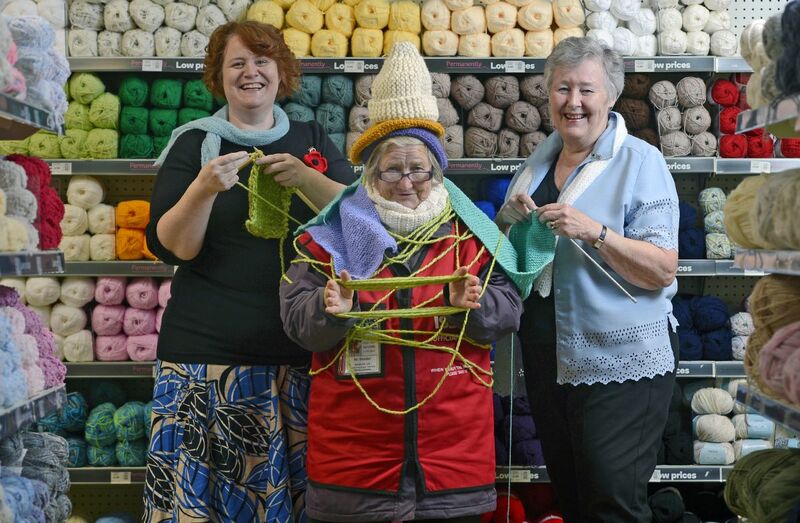 Held in all 83 stores across the UK, the event will give members a chance to knit together, share skills, share patterns and enjoy a cake or two – all in aid of Scotland’s Big Issue vendors. Working outdoors in the freezing winter months, vendors will be protected from the chilling Scottish winds and cold temperatures with cosy knitted hats, scarves and fingerless gloves. Knitters can also donate individual squares that will then be made into patchwork blankets providing some extra warmth during the coldest months of the year. Joining in with the Big Knitathon is easy. SWI members can submit knitted goods or raised funds to their nearest Hobbycraft store throughout November. Simply register for free online and you will be sent a fundraisers pack. www.bigissue.org.uk/event/big-knitathon-2015. To find out more about the Scottish Women’s Institute visit www.theswi.org.uk. With thanks to Paul Robertson. 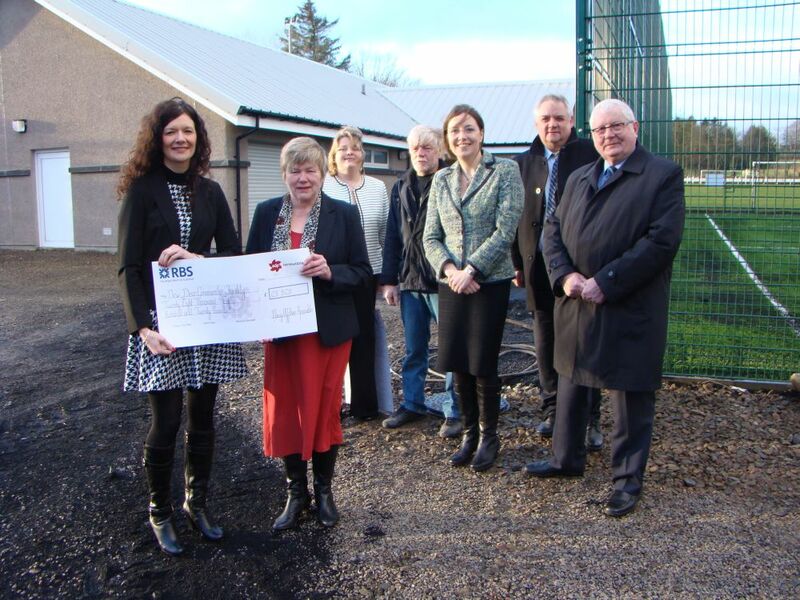 Volunteers at the New Deer All Weather Facility were celebrating this weekend after energy firm Moray Offshore Renewables made a £28,000 donation that will allow the project to be completed after almost nine years. The £405,000 project to build an all weather sports pitch and a new pavilion at New Deer is due to be completed by Easter. Project co-ordinator, Helen Young, welcomed the cash boost which has closed the final funding gap faced by the project. Representatives from Moray Offshore Renewables, which hopes to build a 186-wind turbine farm in the Moray Firth, presented the cheque for £28,820 to Helen Young on Friday in New Deer. With the Scottish ski centres reporting between 30-60 centimeters of snow the 2015 ski season has got off to a perfect powdery start. With thanks to Janice Hopper. The Cairngorms is synonymous with breath-taking mountain terrain and high octane skiing and snowboarding as the depth and range of skiing opportunities across Glenshee, the Lecht and the Cairngorm Mountain is vast and exhilarating. But hurtling down a mountainside isn’t the only way to ski. 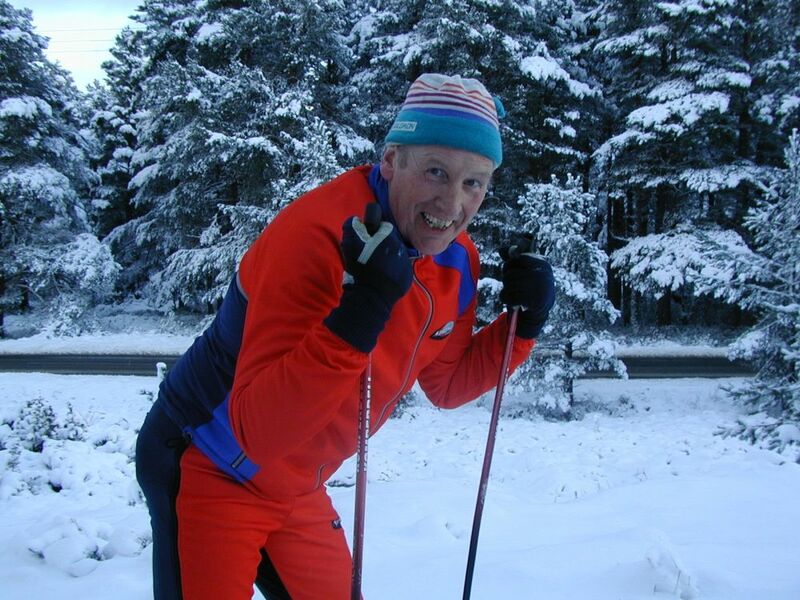 Nigel Wells (pictured), who provides tuition for the Aviemore and Glenmore Ski Shop, is a passionate advocate of cross country skiing which is a completely different approach to experiencing the landscape, expanding your skills on snow and testing yourself. Nigel is a BASI level 2 instructor but he only started skiing in his late twenties proving it’s never too late to start. He left school at 16 and experienced a demanding career with the Police force in Bradford, including becoming a Firearms Officer and a member of a specialist unit involved in the Ripper enquiries and the Toxteth and Leeds Riots, but he was soon looking for his next challenge. Cross country skiing started as a hobby in the 1970’s but after a holiday in Aviemore Nigel became such a regular visitor that he virtually slipped into teaching. When he left the Police in 1998 he made his move to Aviemore to become a full time ski instructor and now knows the terrain of the Cairngorms intimately. “Cross country skiing can be immensely challenging. You don’t have gravity on your side propelling you down a hillside so self-locomotion is the order of the day and that requires some effort on the part of the individual. You use your whole body and can burn around 500 calories an hour. It’s the top all over calorie burner ahead of swimming and cycling and requires huge stamina but it’s also hugely accessible. Depending on the snowfall tracks run through Glenmore forest, taking in Bagaduish, the south side of Loch Morlich and excellent views as skiers cruise past Meall a’Bhuachaille just north of the loch and the forest. The Glenmore Cross Country Ski Machine was an investment to improve cross country skiing in the region and it’s hugely popular for an inanimate object. With its own Facebook page the machine’s run as a charity to encourage the advancement of public participation in sport, but the beauty of cross country skiing is that those who wish to explore aren’t necessarily confined to the tracks but can venture out and explore as desired. As cross country skiing takes place on lower ground it’s more weather dependent than mountain-top snow sports so it’s definitely worth keeping a keen eye on the forecasts. The Aviemore and Glenmore Ski Shop and its instructors have the latest information on the weather conditions, tracks being cut and other suitable terrain available. For dedicated skiers or for complete novices cross country skiing offers a challenging way to get the most out of the stunning Cairngorms countryside and try a form of skiing that can be gentle and peaceful or rigorous and intense. With thanks to Beverly Tricker. 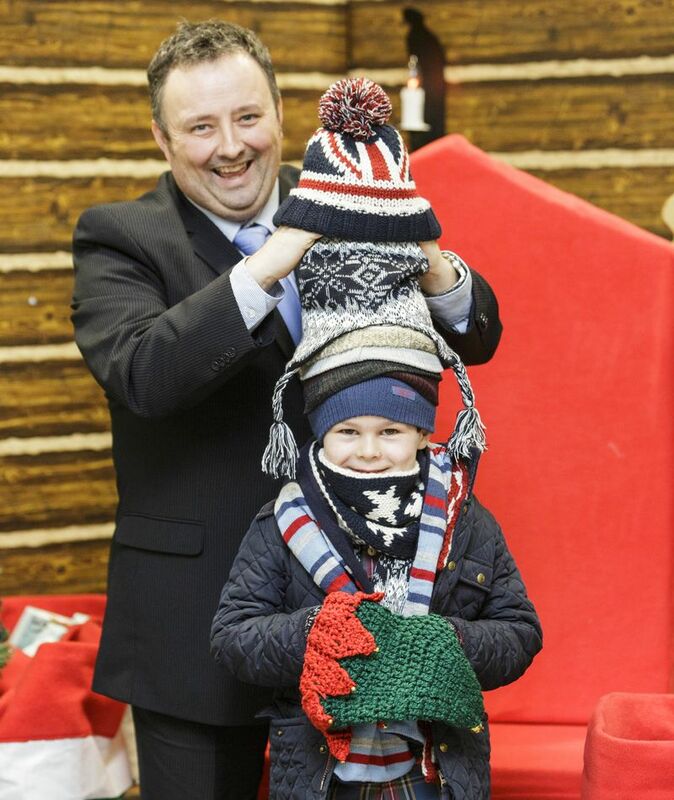 A Cosier Christmas is to be delivered to even more children living in poverty, with the Coats for Kids appeal receiving a second sizeable slice of funding from Aberdeen Asset Management’s Charitable Foundation. AAM’s latest donation of £7,500 sees its support for the winter campaign rise to £37,500 and means that hundreds of boys and girls in need will beat the cold with new warm outfits. But in order to match a surge of late requests for assistance that have come flooding in from agencies and professionals working with families in need, there remains a £4,400 shortfall. If that sum can be raised, then a total of 612 children living across the North-east will benefit this winter. Emma Kemp of Cash For Kids is appealing to other businesses to show some seasonal spirit by donating to the cause. “We’ve been a victim of our own success. After people heard about Coats for Kids in the media, after the very generous donation of £30,000 made by Aberdeen Asset Management Charitable Foundation last month, we had a flood of enquiries from support workers, groups and organisations working with families that are struggling financially. “We did not foresee this demand, and we’re really pleased to receive a second award of £7,500 from the AAM Charitable Foundation which is enabling us to help more families. “If there is any other business out there that could help us reach our target, it would be a great gesture to make at this time of year. Cash for Kids has seen a huge increase in applications for essential clothing for children living in poverty in the Aberdeen area. Many local families have to choose between buying food, heating their home and purchasing essential clothing. Every penny donated to the cause is spent wisely with a deal being struck with a national retailer to ensure that the money stretches as far as possible. Sturdy boots, a cosy coat and socks are among the essential items provided and this means that children don’t have to go to school in cold weather without having suitable clothing. All children helped are identified via support workers, groups and organisations who work closely with families that are struggling with money. The feedback from those working with the families that have already received new clothing highlights the big difference the support makes. Not only does it mean parents don’t have to choose between clothing their child and other essentials, but the children have a sense of pride in having a new outfit to wear. 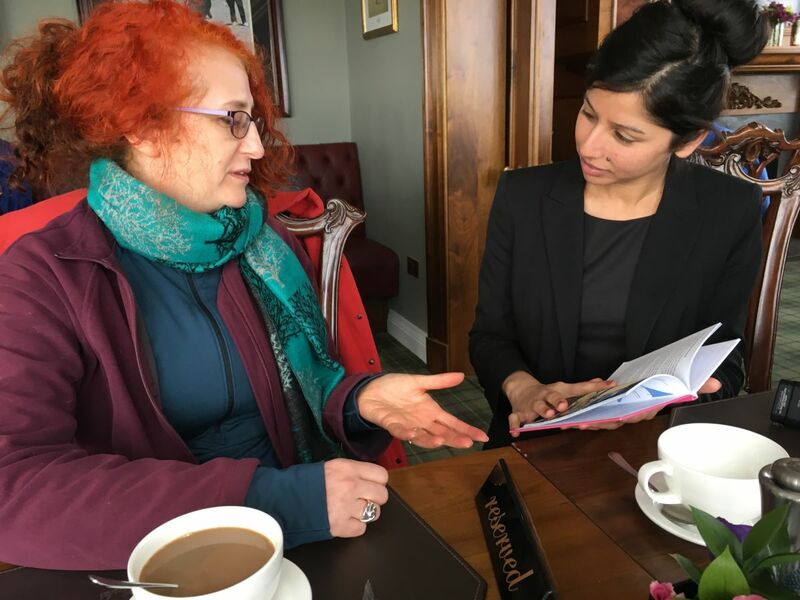 “Our donation totalling £37,500 is the largest single amount to be given from our Charitable Foundation which seeks partnerships with charities where funds can be seen to have a meaningful and measurable impact. The Aberdeen Asset Charitable Foundation was established in 2012 to formalise and develop the Group’s charitable giving globally. In Aberdeen, donations have been made to several local charities including sums of £10,000 each to Cash for Kids, to fund a breakfast club for 12 months, to Friends of ANCHOR for the Gene Machine appeal and £25,000 to the ARCHIE for Skype technology at Aberdeen Royal Children’s Hospital.